October is a wonderful month to enjoy outside. 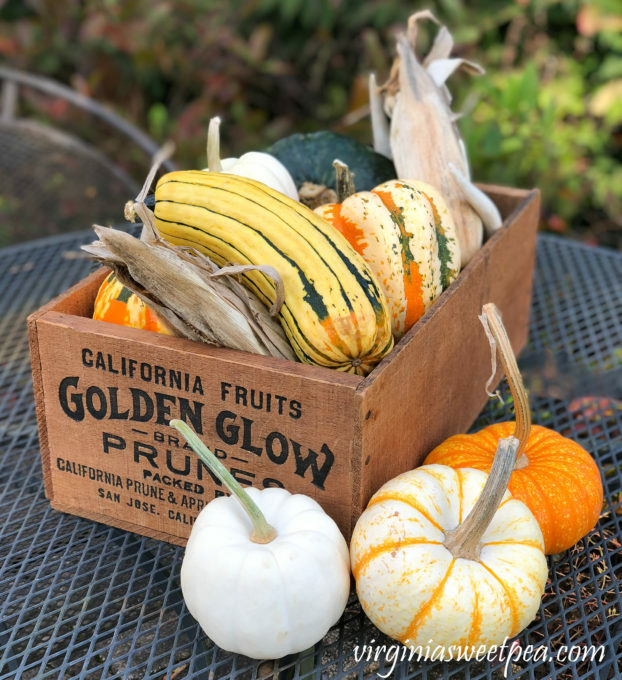 The temperatures are pleasant, the trees are glorious with their changing colors, pumpkins and gourds are plentiful, and Chrysanthemums and Pansies are available for fall planting. 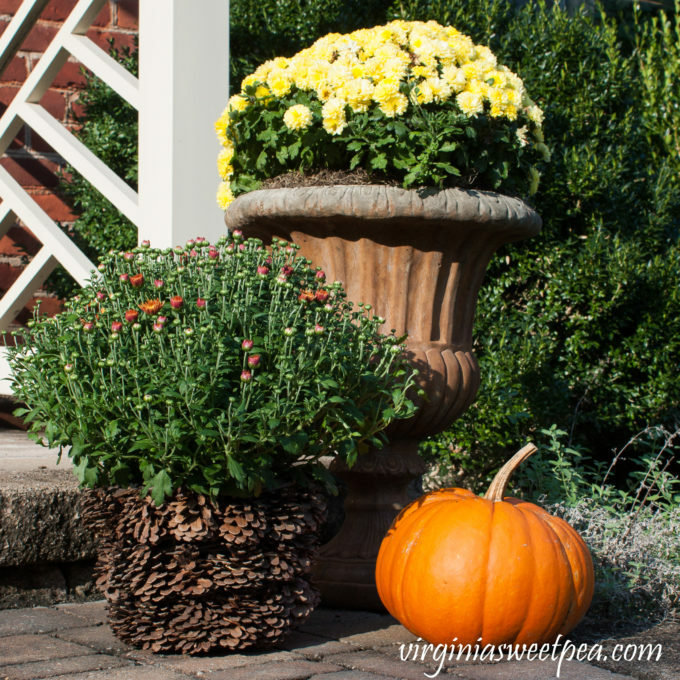 To celebrate the fall season, I’m sharing my Porches Decorated for Fall. 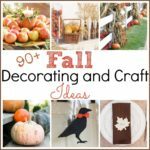 I’m joining a talented group of bloggers who are each sharing how they’ve decorated their porches this fall. This tour is organized by my friend Amber from Follow the Yellow Brick Home. 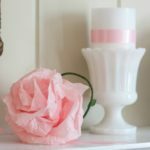 I met Amber last Christmas through a blog tour and loved her gorgeous old home and how she’s decorated it so beautifully with vintage style. 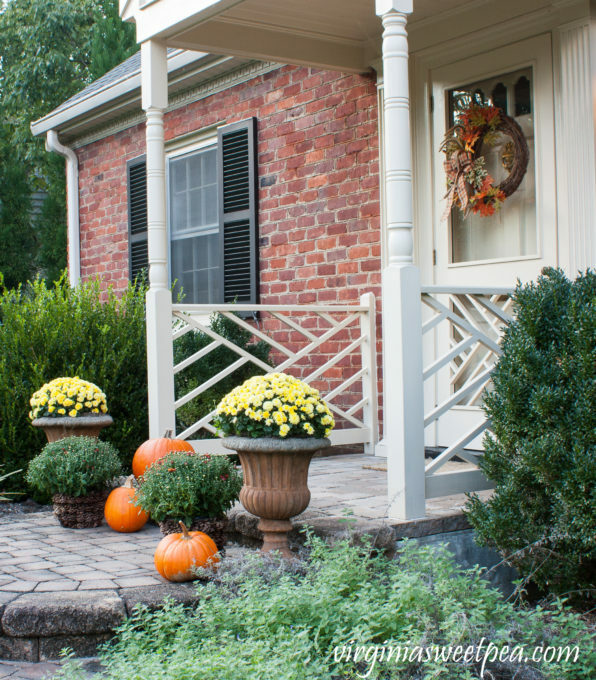 If you like fall, you are sure to enjoy seeing how each participant has decorated their porches and patios for fall. You’ll find links to all of the participants at the end of this post. 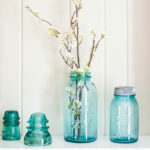 If you are visiting from Belle Blue Interiors, welcome! 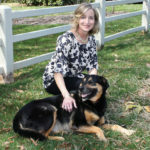 I’m Paula and I live in beautiful Virginia,very close to the Blue Ridge Mountains. I love gardening and enjoy giving our home as much curb appeal as possible. My neighbors especially enjoy my flower beds as what’s blooming in them changes with the season. Right now if you walked past my house, you’d see Fall Anemones, Colchicomes, Beauty Berry, Chrysathamums and Golden Rod putting on a fall show. In a few weeks, my Asters will join the fall party. 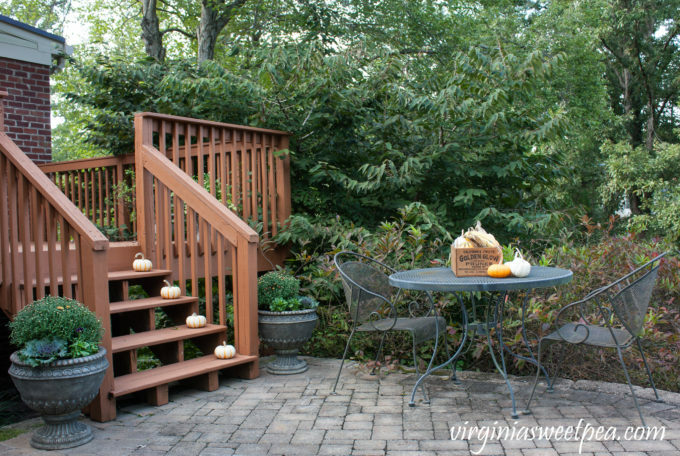 Today I’m going to show you two porches ready to be enjoyed this fall. When the season changes, I start my outdoor decorating with our front porch. Our house is on a corner lot and we have a lot of walkers and runners in the neighborhood. I like for my front porch to be both attractive and inviting for each season. 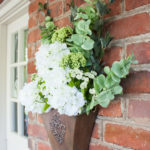 Our front porch is small without enough space for seasonal decorations, but we do have a landing that is a great spot for urns that I enjoy filling with seasonal flowers. When the mums that are currently in the urns fade away, I’ll plant pansies that will bloom through spring. Chippendale doors are very popular in our town. If you walk down any street, you’ll see a number of different styles of Chippendale doors. My husband made our Chippendale railing and he made an identical Chippendale door for our porch. 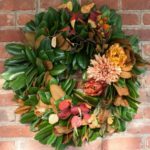 I had plans for making a new wreath for fall but for now am using this one that I made a few years ago. The yellow mums have been in these urns for several weeks and we’ve really enjoyed their pretty yellow blooms. I added burgundy mums and pumpkins for more color. Every year I look forward to the arrival of pumpkins and gourds at our local market and I have to control myself because I want to buy a lot of them. Since our house is on a corner, not only do cars and walkers see our front porch, they also see our deck which leads to our kitchen. At the base of the deck, there are a table and chairs that would make a pleasant spot for eating, but we never sit there as there’s a patio below this area. I didn’t take pictures of our patio but you can see it here and here. When we enjoy sitting outdoors, it’s almost always on our patio. What you are seeing is our real porch decor. When I was taking these pictures, I thought about putting fall pillows and a throw on the chairs, but in the end I didn’t. If you walked or drove past our house, this is exactly what you’d see. To jazz up the table for fall, I made a centerpiece by filling a vintage crate with autumn squash, pumpkins, ears of corn, and deer antlers. 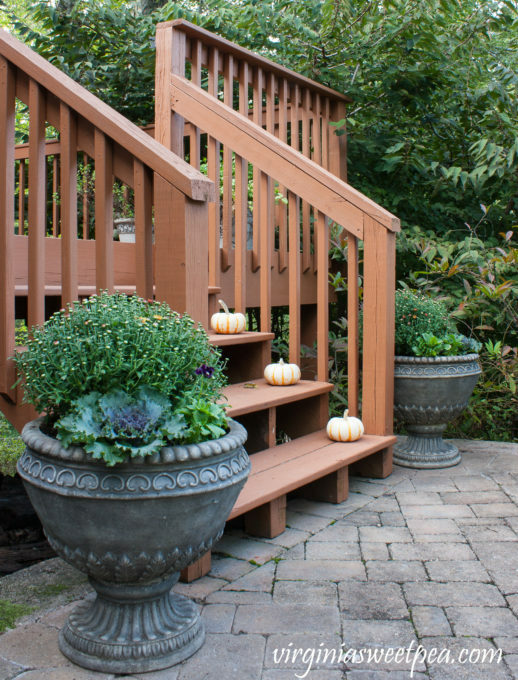 The planters flanking our deck steps are filled with mums, ornamental kale, and pansies. The pansies are purple and will look pretty with the rust colored mums when they both start to bloom. 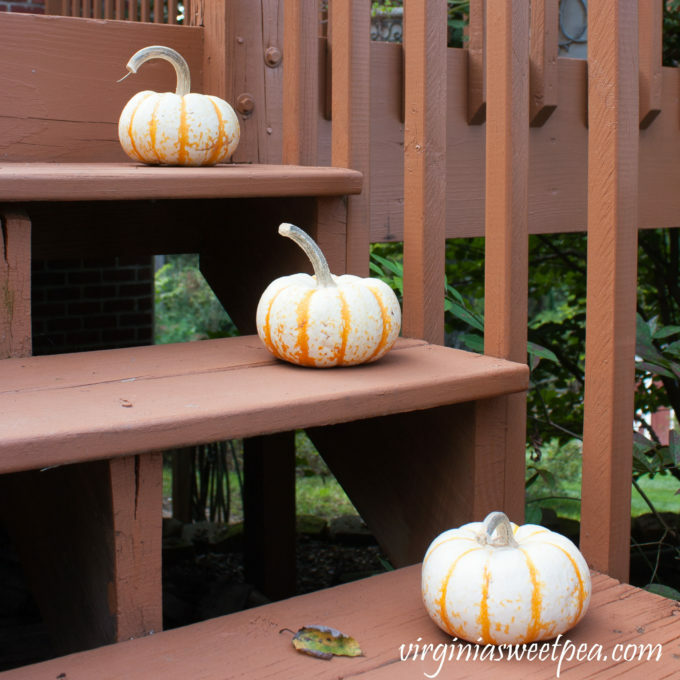 Small pumpkins line the steps leading to the deck. Our deck is currently without furniture. We used to have a set of Adirondack chairs with a table that we made on the deck, but after years of being exposed to the weather, they finally started to fall apart and we had to throw them away. Making new deck furniture is on our “to-do” list. Thanks so much for visiting with me today as I shared my Porches Decorated for Fall. 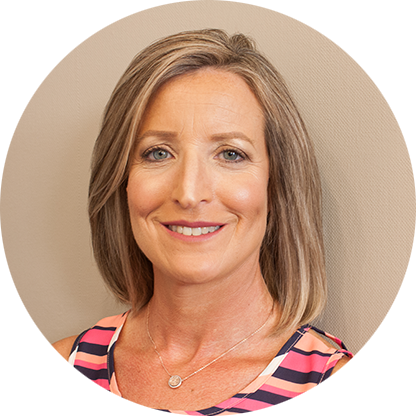 Next on the tour is Kristen from White Arrows Home. 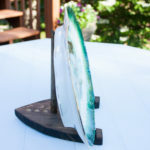 I know you’ll enjoy seeing her outdoor space in her Wisconsin Northwoods Home. 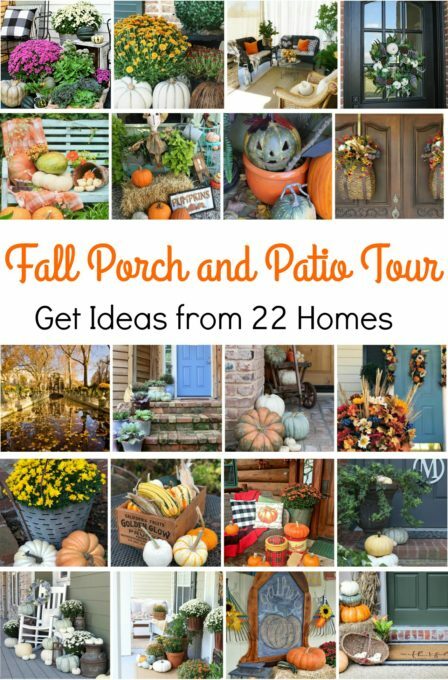 Thanks again to Amber for organizing this Fall Porches and Patio tour. I’m really looking forward to visiting each participating blogger and I know that I’m sure to be inspired. Click on the links below to enjoy each post. I adore your front porch! The pickets matching the pickets on the screen door are so charming. Happy fall my friend, You always create welcoming inspiration! 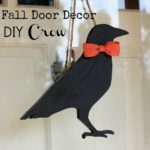 I love your classic approach to fall decorating, plus the Chippendale details around the front door are beautiful! Happy touring! Gorgeous. I love your porch and those urns are so pretty. I haven’t seen a pine cone planter before, but yours is fabulous. How fun is that. So lovely, Paula! I’m in love with your Chippendale door and railings! They give such a dressed up, charming feeling to your entry! Lovely fall colors! Paula I am absolutely enchanted with your Chippendale door and railing! Your husband is so talented. The mum filled urns are the icing on a lovely autumn cake. Paula, your front porch is gorgeous decorated for autumn! I am so happy to have found your blog through this tour! You have a beautiful home! Happy Fall!!! Your door and railing is stunning. You hubby did a phenomenal job! Love all your bright color everywhere. And that acorn planter is perfect for fall. I’ve never seen one like that. Love it all! Your urns are so beautiful with the colorful mums. I love the pots sitting below the urns, they look like pinecones! Enjoy your beautiful porch! Love your front porch and back patio/porch. The Chippendale trim on the front railing and door are fabulous, I love that style. Mums are classic, as are pansies. Those containers of cones are unique! I use pansies in my annual beds from late fall through spring just as you do in your containers and beds. I especially love the back containers with mums, kale and pansies. Your home looks very inviting, and I’m glad you’ve been part of this tour. Happy Fall! Paula it is all so pretty! 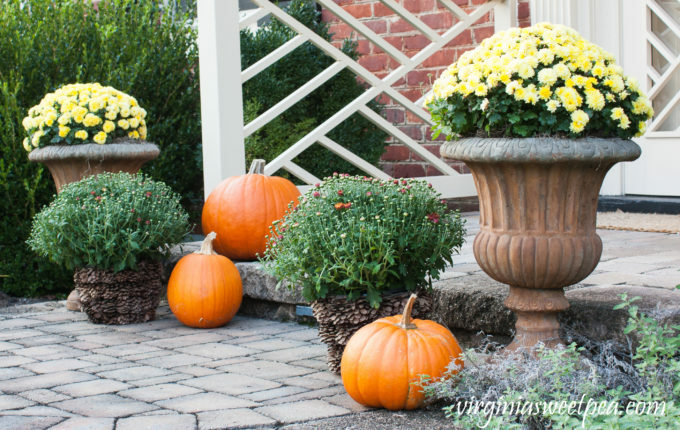 I love pumpkins and mums kn urns. 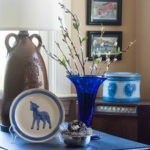 Your urns are really beautiful! I spotted that pine cone pot right away! So unique and perfect for fall! Your back patio looks so inviting and I am sure it is gorgeous back there this time of year. I love your kale, mums pansies in the urn and the striped pumpkins lining the steps! Of course the vintage crate filled with autumn goodness is awesome too! Thank you for joining us for the tour! Happy fall! Both your porch and deck are decorated beautifully! I found a treasure trove of red glass dishes in Virginia about 9 years ago. Chippendale…have never heard of that; thanks for teaching me something new! Love, love those pinecone planters you have the mums in! Where did you get those? Fun to get a tour and see your pretty home! 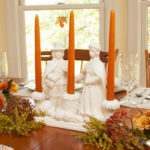 I love how it’s so easy to decorate with natural things in the fall. Thanks for sharing on To Grandma’s House We Go! All of your outdoor areas are so pretty, beginning with the Chippendale railings and front door with the rounded paver walkway. I love Virginia and lived in the Virginia suburbs of Washington, DC when I got my first real job after graduating from college in Alabama. Your home reminds me of how beautiful the neighborhoods were in Springfield, VA. 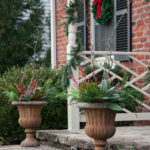 Your outdoor decor are some of my favorite styles… the footed urns. Your back patio area is very welcoming, and I know your neighbors love looking at your gardens. Your railings and door are amazing!! I love them! 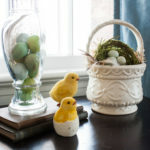 Your centerpiece for your table is wonderful and so is that pinecone planter!! So fun to tour with you!! 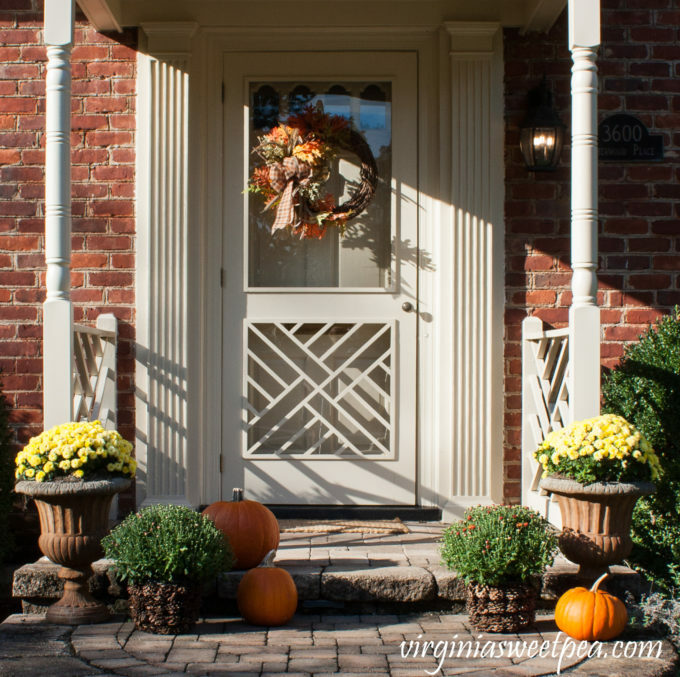 I love all of the fall touches you added to your front porch! 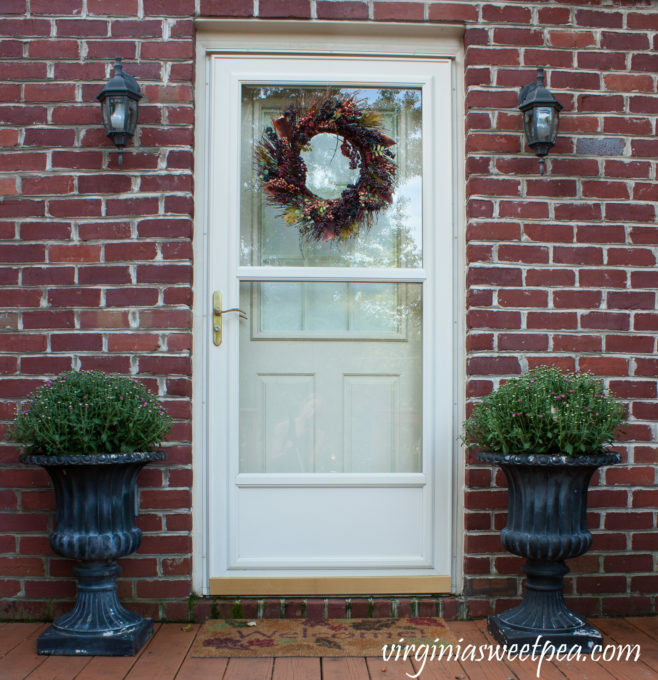 Your front door is gorgeous – I can’t believe your husband made that! So fun to join you on this tour. 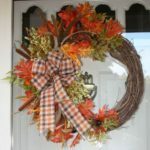 One doesn’t need a big p to have a welcoming entry and you have made yours styled for the season. 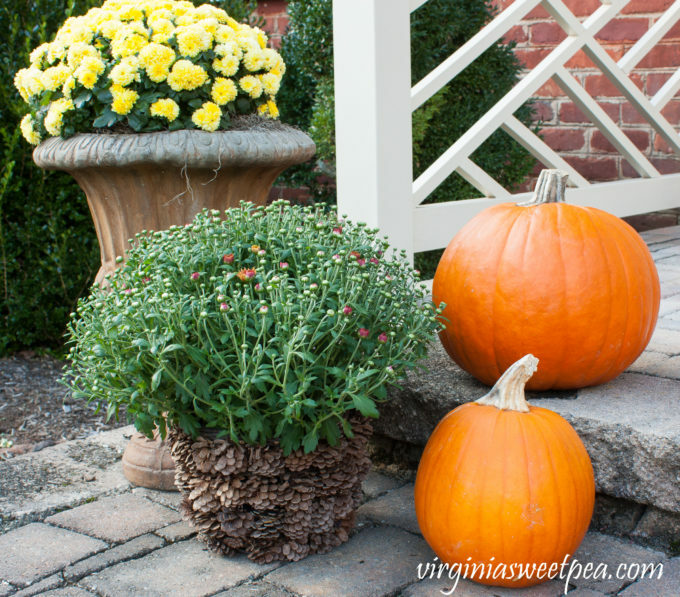 Pumpkins and mums are the staples of the season. Happy Fall!